Traveling Tech Guy Blog: What's Worse Than a Terrorist at the Airport? What's Worse Than a Terrorist at the Airport? The answer: little Timmy, listening to an MP3 on his iPod. Yep, little Timmy is worse than hundreds of terrorists, according to the RIAA and MPAA. Silently, behind our backs, the copyright lobby has pressured the US government to pressure foreign governments (Canada, Japan, Switzerland the EU etc.) to accept ACTA - the "Anti-Counterfeiting Trade Agreement". The agreement calls for random searches at border crossings of iPods (or any other media player), computers and storage devices to find "illegal content". How can a security official at the border determine that your songs were acquired illegally? He can guess, or assume, or whatever - the point is, according to the agreement, he can fine or arrest you for "counterfeiting". More than that, the agreement would force ISPs to provide user information - without court order, and would even restrict the use of online privacy tools. I guess security officials don't have enough on their hands, looking for terrorists, drug smugglers or other unsavory characters. Now they have to do the RIAA's work as well. 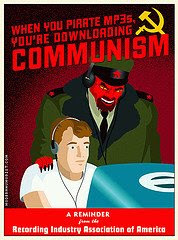 Because every MP3 you listen to means the terrorists have won (or so they have you believe). But even if you're a law abiding citizen, buying your songs and movies on iTunes and such, you are not safe: ripping your own CDs and DVDs is also considered illegal! It violates "fair use" - according to the copyright mafia. The fact that the agreement is kept in the dark, suggests that it contains some fishy parts and that it would be foisted on us in short notice. More about ACTA can be found on the EFF site, along with a campaign to contact your senator and demand the agreement sees the light of day. Since 9/11, many undemocratic motions got to see the light of day and even passed into laws (DMCA anyone?). Is this the democracy we want to export? Instead of a dictator, we'll be ruled by a lobby of short-sighted companies, that could have solved piracy long ago, by welcoming the 21st century and the media distribution methods it brings.